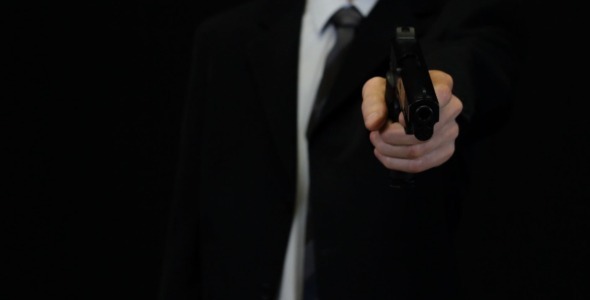 Business man, murderer or FBI agent lifting hand and pointing a pistol at the camera. Good footage for corporate videos, commercials, business promos etc. Alpha Channel: No; Looped Video: No; Frame Rate: 29.97; Resolution: 1920x1080; Video Encoding: Apple ProRes 422; File Size: 362.2mb; Total Clip(s) Length: 0:12. Keywords: agent, assassin, bodyguard, caucasian, crime, criminal, gangster, handgun, mafia, pistol, police, secret, security, spy, weapon.